Easy, however sand makes for slower walk. A picture perfect spring day at the beach. Napatree Point is a conservation area that extends about a mile and a half into Fishers Island Sound with an abundance of birds. It is a stunningly beautiful location. I started at a parking lot at Fort Road, then headed towards the cabanas, onto the beach and turned right. Walking the mile and a half along the Atlantic side of the point I came across several seagulls and plenty of seashells. Watch Hill Light was behind my left shoulder and it was so clear that the Montauk Light at the tip of Long Island could be seen. Near the end of the point several large rocks and some old pilings mark the end of the sandy beach. In the distance the Latimer Reef Light, which is in New York, was also visible. Just around the bend was much evidence of last years Hurricane Sandy. Huge chunks of the embankment were missing. I did find a way up the embankment and started making my way around a maze of very narrow trails until I came across the remnants of Fort Mansfield. The fort was once used as a artillery defense at the opening of Long Island Sound. From this vantage point I could easily see the Connecticut coastline and Sandy Point. 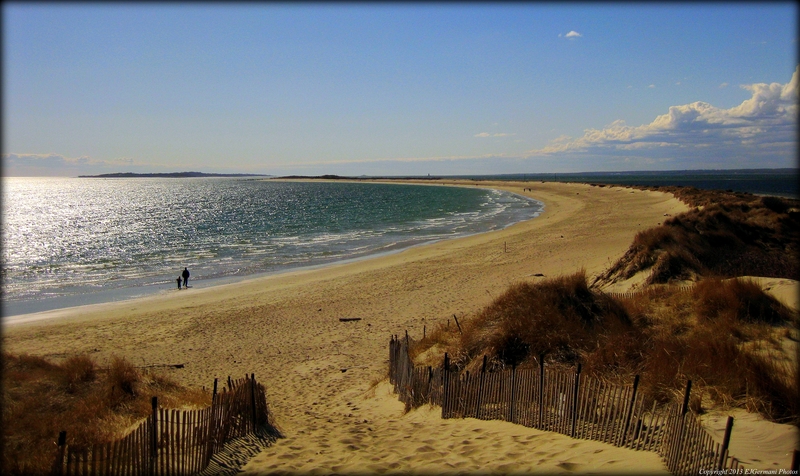 Sandy Point is an island between Napatree Point and the Connecticut coastline. It was once part Napatree Point until the 1938 Hurricane came through and severed it from the mainland. For a place of so much beauty, it does have a tragic history. 15 people had perished at Napatree during that hurricane. After leaving the fort I found another trail that took me back to the south shore of the point. I started walking back until I got to an area near an osprey nest. This is where I found a path to cut across the dunes to the north shore of the point. Then I turned right and started making my way back along a body of water known as Little Narragansett Bay. Along this stretch I came across sanderlings and many snails. Before heading back to the car I decided to climb up the highest dune on the point. Most of this area is closed off for dune restoration, but there are paths that you can follow. The picture from the dune made the climb well worth it.